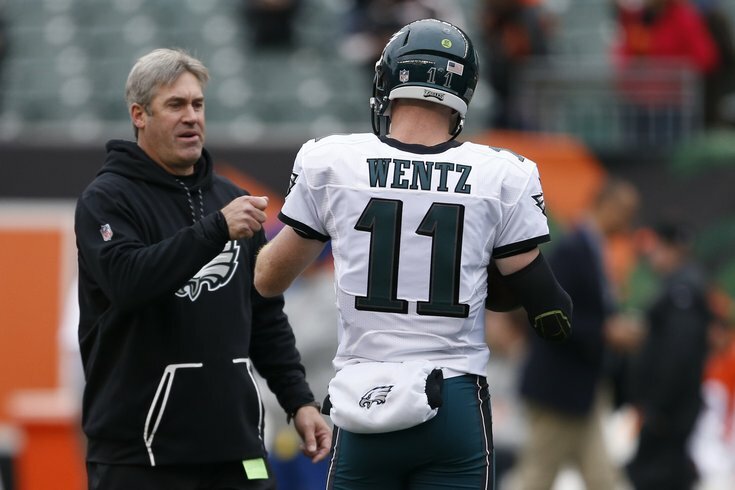 Philadelphia Eagles quarterback Carson Wentz chats with head coach Doug Pederson prior to their Week 13 loss to the Cincinnati Bengals. The Philadelphia Eagles haven't been eliminated from playoff contention ... yet. However, that could change this weekend with a loss to the Washington Redskins, which would all but shut the door on any hopes that their season extends past New Years Day. Even now, the odds stacked against them are a mile high. According to playoffstatus.com, the Birds currently have a 99 percent chance of missing the playoffs. And even if they win out to go 9-7 of the season, there's still a 70 percent chance they don't make it; winning three of four nearly guarantees they miss out. So should the Eagles allow winning to take a back seat to the development of quarterback Carson Wentz? "Yeah, that's a great question, but this is not the time to pull off, obviously," Pederson said Wednesday. "We've got to continue – like you said, we're still in the [playoff] conversation. Even though it's down there, we're still in the conversation. Four games is a lot of football. It's a quarter of your season, and by no means do we want to ease up now. "This is not the time [to ease up]. This is actually the time to push forward and still be aggressive and do the things that we did earlier in the season and try to get back to that level of play. That's the beauty of having an opportunity. The other thing, too, is with three out of the next four [games] at home becomes huge for us down the stretch in hopes of getting to where we want to be." Still, Pederson can continue to fighting for a playoff spot that he seems unlikely to achieve while also lessening the burden on Wentz. The rookie QB's averaged 44 passing attempts over his last six games, which is a huge number for anyone, let alone a freshman. Through the first six games of his career, he was averaging a much more manageable 31 passes per game. And his numbers suggest that throwing more often has not been beneficial to the 23-year-old. Part of the reason he's been asked to do more recently is because of the overall poor play of his teammates. It's beginning to seem like the Eagles are falling behind every week, forcing them to play catchup and, ultimately, rely on their rookie's arm to try to get back into games. Volume aside, if they're unable to establish anything resembling a ground game -- like against the Bengals when the running backs totaled just 33 yards on 15 carries -- how can they expect to keep the defense honest and thus give Wentz a chance to throw without seven guys dropping into coverage? While Pederson admitted he needs better balance on offense, something that should be aided by the return of Ryan Mathews on Sunday, he doesn't believe that imbalance is negatively impacting his quarterback. "I think the effect is that we have to do better in the run game," Pederson said. "I've got to do a better job there calling more runs and trying to maintain or limit the number of throws. Again, you never want to throw 60 times. It's kind of a recipe for disaster. But I don't have any concern with Carson. "I think Carson's right on track and where he needs to be, and he does an outstanding job every week and you look at some of the throws he's made. So I don't concern myself with the number of throws. We just try to limit them when we can." On Sunday, Wentz will get his first chance at revenge as the Eagles host Washington. In their Week 6 loss to the Redskins, Wentz threw just 22 times (a season low) and completed just 11 of them (also a season low, just like his 50 pct. completion rate). Oh, and he was sacked a season-high five times in the team's first game without Lane Johnson. With Washington's defense near the bottom of the league in yards per carry, Pederson may be able to accomplish both things -- trying to win and limiting Wentz's throws -- in this one.